Of course we ate more than 4 times but those were the most note worthy culinary experiences. I am an absolute nut for New Mexican food. The absolutely intoxicating scenery may add to the general splendor but why pick apart a good thing. Everything is bigger and better in New Mexico. 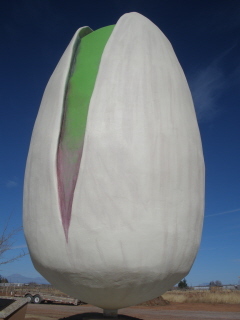 Take for instance the giant pistachio shown below. We high tailed it for home after two days in New Mexico. The 'high tailing' it part caught up to me (or, so I thought) somewhere in OK. All of a sudden lights were flashing behind me and sirens were blaring. Oh crap, I got caught doing 78 in a 70 mile per hour zone. Nope. I was pulled over for not using my turn signal for a lane change. The cop politely asked me go back to his car where he had me sit in the front seat for what felt like a full on interrogation. Where have you been? Why was the car at your grandma's in Ca? You left it there for 6 months? What did he think my mother and I were up to anyway?! This strange event on the last day of our road trip was making us incredibly hungry and craving some local fare (must have been the stressful interrogation). Luckily we were approaching BBQ country. We happened upon a great place for BBQ right off the freeway near Wichita. After devouring my sandwich I was only left wanting more. Does anyone know how you get hungry riding in a car all day?!! That brings me to this week's pizza selection: Pulled Pork BBQ Pizza. You might be surprised how good this really is! Cutting the BBQ sauce with stewed tomatoes really was a great way to get the sugar content down to a reasonable level. You're going to love it! Preheat oven to 500°. While the oven is heating shape your dough into the desired shape, adding as little flour as possible. Poke several small holes in the crust with a fork to prevent bubbling. Transfer pizza dough to whatever, pan, stone, etc you will be using for cooking. Brush crust with a bit of extra-virgin olive oil, and cook without toppings for about 5 minutes. Mix pulled pork, BBQ sauce, and tomatoes together and stir to combine, this will act as your sauce so make sure you have enough to cover the crust. After removing the pizza crust from the oven layer the BBQ mixture, then pine nuts, cheese, and green onions. Cook for 10 or so minutes more, or until golden brown. 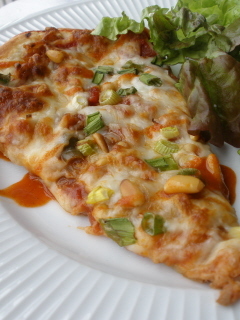 Want to see some more delicious pizza recipes?! Click here. Trying to feed adults and an almost toddler can be a challenge for us, but gives me a nice excuse to push me a little bit. I LOVE quinoa and especially love that it is a complete protein without any additional help. Forming it into patties seems like a no brainer and makes for a perfect finger food for my 11 month old Max. What?! Don't believe me that an 11 month old would like to chomp on quinoa cakes? Ok, see for yourself then! QUINOA CAKES RECIPE - This recipe is adapted from Whole Foods 1 cup quinoa, rinsed and drained 2 cups water 1 1/2 tablespoons finely chopped red onion 1/2 teaspoon finely chopped garlic 2 Cups left over veggies – I used broccoli, kale, and green zucchini I had leftover 5 basil leaves finely chopped Zest of 1 large lemon 1/4 cup whole wheat flour 1 teaspoon baking powder 2 teaspoons flax seed bran 1 egg 1/2 teaspoon freshly ground black pepper 1 1/2 tablespoons chopped fresh dill 1 1/2 cups plain nonfat yogurt 2 teaspoons lemon juice Bring quinoa and water to a boil in a medium pot. Reduce heat to medium low, cover and simmer until liquid is absorbed, 20 to 30 minutes. Set aside off of the heat for 5 minutes, then fluff with a fork and set aside to let cool. Preheat oven to 400°F. In a large bowl, combine cooked quinoa with onion, garlic, veggies, basil, zest, flour, baking powder, egg, and pepper. Form mixture into eight (4- to 5-inch) patties and arrange on a baking sheet with a silicone baking mat. Bake, flipping halfway through, until lightly browned and just crisp, about 25 minutes. Stir together dill, yogurt and lemon juice in small bowl, then spoon over warm quinoa cakes. Before I start with the recipe, I must address my tardiness in posting to my beloved food blog. “Was it something we did?” you might ask yourself. I will respond we a resounding NO!!! It isn’t you, it’s me. It was a much needed break, and I have returned feeling rested, recouped, revived, and reinvigorated! My fingers are ready to type and my mind is tripping over itself with tantalizing recipe ideas. While I was gone, we had a baby! Yep, a bouncing baby boy that is nearly 9 months old. He is happy, healthy, and just a joy to be around. While I spend a good deal of time pureeing, I am cooking a few ‘solids’ for his dad and I to enjoy. I’m back, and I hope you will be too! Back to the post at hand…I was trying to come up with a salad dressing that is both homemade, and quick to prepare (my priorities have changed a bit). This salad dressing recipe fits the bill! Enjoy this three ingredient salad dressing. MEYER LEMON SALAD DRESSING 3 parts extra virgin olive oil 1 part meyer lemon juice As many herbs as you have handy – I used thyme, rosemary and some chives from my balcony garden Salt and pepper to taste In a small covered dish combine the olive oil, lemon juice, and herbs. Let steep for an hour or two at room temperature before using. Strain, and enjoy over any greens of your choosing. How Can I Help with the Michigan Heritage Pigs Being Slaughtered? Here is the situation, starting over the weekend the DNR has begun slaughtering farmer’s Heritage Pigs on their property in Michigan. Yes, the DNR. First, they shouldn’t have a thing to do with farm livestock. Secondly, these poor pigs are being killed for the gain of the commercial pork producers. Killing off ones competition is apparently acceptable now? Farmers are killing their own animals so they will not be committing a “felony”. That is a better alternative at this point. My stomach turns as I type. It is a terrible tragedy and other states are waiting in the wings to enact similar atrocities. I can hardly believe this is happening in my home state. This isn’t something that effects just tree hugging hippies in California. This is a fundamental issue that must be stopped immediately. I have yet to see any traditional media outlets cover this and I am outraged. Will we soon be told that raids on our vegetable gardens have begun because we can no longer grow our own tomatoes because that should be left to the commercial growers? For more information please read this excellent article written by Mother Earth News Michigan Begins Heritage Hog Slaughter Please respond in your own way but please do be responsive. If we could reach out to the media outlets and demand coverage and the politicians we voted for and elected with our ballots we might be able to stop this before it becomes even worse. What can we do to help spread the word? First, call, email or mail the offices of the politicians involved and tell them to rescind the ISO:Governor Rick SnyderState CapitolP.O. Box 30013 Lansing , MI 48909 Rick.Snyder@michigan.gov Phone: 517-335-7858 Rodney Stokes, DirectorMDNRP.O. Box 30028 Lansing , MI 48909 STOKESR@michigan.gov Phone: 517-373-2329Secondly, let your media outlets know. Write on their Facebook Fan Pages, email them, try to get through to them and use your contacts to notify them that you would like coverage. The addition of pear is very welcome for me in this cranberry sauce recipe. My family has been throwing homemade applesauce in our cranberry sauce for years, but never has a pear been met with the ruby red jewels of winter. Pear this cranberry sauce with some great friends and family and have yourself a merry little Thanksgiving, and Christmas too! This year I am thankful for food choices. We make choices with every dollar we spend on food. Whether conscience or not, each dollar spent makes a decision in the future of our food. I am grateful to now live in a place where farmers markets are abundant and supporting them makes me feel a part of a growing community of people who refuse to have decisions made for them. CRANBERRY PEAR SAUCE (enough for a Thanksgiving side dish) 3 cups fresh cranberries 2 bosc pears - peeled, cored, and cubed 1/2 cup apple cider 3/4 cup turbindo sugar – or more to taste 1/4 teaspoon cinnamon Place all ingredients in a medium sized saucepan, and cook over medium-low heat until cranberries pop, and it looks like....well sauce (about 20 minutes)! Cool at room temperature and refrigerate until ready to serve. I’m back! It has been months since I had a new blog post and for that I do apologize. However, there are no excuses. I simply wanted to take a break and so I did. There! This summer was filled with a move to the west coast, and fantastic visits from family and friends! We are certainly adjusting back to being on the west coast with ease. We can be found kayaking, hiking, biking and enjoying the general beauty of the Central Coast of California. Since I’m back to the land of milk and honey…er…land where farmers markets happen so often there is a daily mention of them in the newspaper. Yes, seriously! You can imagine how happy I was to see that! With bellies full stuffed with local produce I bring you… SIMPLE TOMATO SALAD (SERVES 1) 1 large, ripe tomato (any old color, variety as long as it is ripe and ready to go) 4 basil leaves – finely chopped 1-2 cloves garlic – minced drizzle of extra-virgin olive oil salt & pepper to taste Mix all ingredients and enjoy with toast, over a bed of lettuce, add raw goat cheese, or devour as is. Click on Salad Recipes for some more scrumptious salad ideas. Sweet Potato Baked Fries We have been obsessed with Sweet Potato Fries as of late. We may be single handedly keeping the Sweet Potato farmers association afloat. Previously, I was not a Sweet Potato fan. I endured them. However, I have had a change of heart! These fries are delicious and so incredibly simple to make. I recommend serving them with a little spicy barbeque to offset the sweet flavor that is inherent in these gorgeous little Sweet Potato Fries. BAKED SWEET POTATO FRIES (Serves 2) 2 organic sweet potatoes - cut into French fries Olive oil Sea salt, pepper and jalapeño powder to taste Preheat oven to 350°. On a baking sheet lined with a non-stick baking mat toss fries and a drizzle of olive oil (use sparingly or they won’t crisp up). Arrange fries in a single layer. Dust with salt, pepper and jalapeño powder. Bake for 20 minutes at 350°, flip once and continue to cook for up to 15 more minutes. Be careful not to let them burn….yes, learn from my mistake. This particular rhubarb Crumble is special for two reasons. The first is, it also contains Marion Blackberries which are absolutely incredible with Rhubarb. Although I think Rhubarb is a standalone delicacy needing no additional accompaniments. You see I was a pretty fortunate kid. I had the opportunity to visit my grandmother (affectionately known as Raisin) in the Central Coast of California. What made me even more fortunate is that she has a fabulous Meyer Lemon tree and a patch of rhubarb that we would use to make sauce, rhubarb custard pie (family recipe that is divine), and other tasty treats. This brings me to the second reason that that rhubarb crumble is so special, today happens to be Mother’s Day. While I am not fortunate to be with any of the women in my life that helped me become me, I can bake a tasty treat that will remind me of our good times together. Not only do I have a grandmother (Raisin) that I adore, but I have a wonderful mother, mother-in-law, aunts, sister-in-law, cousins, and numerous friends that have filled so many roles for me in my life. From these extraordinary women I have inherited my sense of humor, cooking skills, fashion sense, and resistance to being anything other than myself. (You will notice that athletic ability has been omitted from the list. This was intentional and not an oversight.) My life story could never be told without each and every one of my family, and friends that are just like family to me. My heart would never have been complete without each and every one of them. There are hardly enough words to express my gratitude for these incredible, powerful, strong, beautiful women. Happy Mother’s Day to my mom and all the grandmas, mothers, aunts, sisters, cousins, and friends out there! This recipe was adapted from a recipe on the back of Stahlbush Island Farms frozen rhubarb. I have adapted the recipe a bit for my own personal preference and I encourage you to do the same. Crumbles are incredibly forgiving, and come together quickly. If you are looking for some more easy dessert ideas look no further! RHUBARB BLACKBERRY CRUMBLE (1-10” pie) 10 ounces rhubarb, frozen10 ounces blackberries, frozen (could use any kind of berry)1 stick (1/2 cup) pastured butter, slightly softened1 cup + 2 tablespoons whole wheat flour1 cup + 2 tablespoons raw cane sugar1 teaspoon flax seed powder½ teaspoon cinnamon1/2 cup old fashioned oats Preheat oven to 350°F. Pour frozen rhubarb and berries into 10” glass pie pan or 9” baking dish. Sprinkle 2 tablespoons flour and 2 tablespoons sugar over berries and rhubarb and toss together until slightly blended. For crumble topping: In separate mixing bowl, add 1 cup flour, 1 cup sugar, falx seed powder, cinnamon and butter. Using a pastry cutter or fork, mash butter into flour and sugar until pea-size crumbs form. Stir in oats. Spread crumbly toppings over rhubarb and berries. Cover edge of the pan with a foil strip to prevent crust from becoming too dark. Bake for 50 minutes or until topping is golden brown and fruit is bubbling. I’ll never forget popcorn night as a child as the tiny kernels would magically transform into white fluffy goodness. As an adult a fantastic friend, who happened to be my boss at the time would make popcorn at work as a much needed respite to the day. She single handedly rekindled my love of popcorn. Let me make this clear, the stuff that comes in a little bag, and is stained with food coloring is not popcorn. Not even close. Popcorn is a whole grain too, and when you make it from scratch you can control what is put on it. The closer you are to the source of your food the better! Looking for more snack ideas? Look no further! Now I would like to share with you my recipe for… HOT ‘N SPICY POPCORN (Enough to share for 2 people…if you want) 1 tablespoon olive oil1 cup popcorn kernels (try to find no GMO labeled corn kernels)2 tablespoons melted pastured butter1 clove garlic – minced¼ teaspoon jalapeño powder – or some other hot goodnesssalt & pepper to taste Over medium heat place the olive oil in a large sauce pan, that has a tight fitting lid (glass lid preferably). To the oil add 3 kernels of corn. Now sit back, relax and listen for those kernels to pop to perfection. When you hear one pop add the rest of the popcorn. As the kernels begin to do their thing, shake occasionally to prevent burning. You will know the popcorn is done when the pops have all but stopped. In the meantime mix the butter, garlic, and jalapeño powder in a small bowl. When the popcorn is done, transfer it to a large enough bowl to hold all the popcorn goodness, and then drizzle the butter mixture over your popcorn. Eat quickly before someone else does. Not being much of a breakfast food person I typically stick to cereal (hot or cold). The trouble here is that breakfast foods are my husband’s absolute favorite. It is not that I’m overtly trying to avoid his favorite foods. I just don’t typically think about sausage and eggs, pancakes etc. So, for two glorious days I cooked a nice big breakfast. Day 1 we had these wonderful little whole wheat pancakes. I was sure they were going to be dense, but to my dismay they were light and fluffy. Day 2 we served up some left over St. Patrick’s Day favorites in the form of corned beef hash. Today I’ll be sharing my recipe for these wonderful little whole wheat pancakes from scratch that are surprisingly good, if not great! I loved them! And I was pleasantly surprised how long it took for me to become hungry. I typically find myself crashing and burning with these sorts of breakfast treats (maybe it only tastes like a treat). Looking for more breakfast ideas? Look no further click here! FLAX BERRY POWER PANCAKES - WHOLE WHEAT PANCAKES (SERVES 2) DRY 1 cup whole wheat flour1 tablespoon raw sugar2 teaspoons baking powder½ teaspoon cinnamon½ teaspoon flax seed – ground (grinding it means that your body will receive the nutrients) WET 3/4 cup milk1/2 cup yogurt1 egg1 tablespoon oil1 teaspoon vanilla½ cup frozen berries + more to mix with syrup Mix all of your dry ingredients together and set aside. In a separate bowl mix all of your wet ingredients accept the frozen berries (they will come into play in a minute). Start to add the dry mixture to the wet until they are well combined. Add the frozen berries by gently folding them into the mixture, crushing them will turn you batter blue and pink. On a well oiled hot skillet add the batter in ¼ cup scoops. When the pancake bubbles and is done on the edges it is time to flip them. Allow them to cook for an additional 2-3 minutes or until they are golden brown. While the whole wheat pancakes are cooking I like to heat syrup with some berries in a small sauce pan. This will allow you to cut down on how much syrup you use and will give you some more berry goodness. Enjoy piping hot with some coffee and a good book. Oh the doldrums of winter have been broken by this bright and flavorful salad. The ingredients were sourced locally from a grocer that maintains hoop houses throughout the winter. This allows us to have beautiful micro greens on which to place our gorgeous Chioggia Beets, and dug out of the ground that day Carrots (I watched them do this – so I know it’s true!). According to my Baker Creek Heirloom Seed catalog the Chioggia beet is: A pre-1840 Italian heirloom beet, this variety arrived in the USA prior to 1865. They have light red skin and beautiful rings inside, like red and white candy stripes. The flesh is very tender, mild, and sweet. Named after a fishing town in Italy. I was lucky enough to spend a few days in San Diego where I was reminded how easy it use to be to find fantastic produce. I have to look a little further nowadays but it is truly worth the effort and cost. Our grocery budget is by far our biggest expense. That’s ok. I’d rather spend more on real food than less on the fake stuff. WINTER MICRO GREEN SALAD (serves 2 as a side) DRESSING 2 tablespoons shallots – thinly sliced1 tablespoon local honey¼ teaspoon chili garlic sauce – this is the spicy part and is optional½ teaspoon sesame seeds – toasted½ teaspoon apple cider vinegar1 teaspoon oil – olive, veggie, etc SALAD 2 small handfuls micro greens1 small beet – julienne1 large carrot – julienne DIRECTIONS In a small bowl combine all dressing ingredients, stir, set aside. On two small plates equally divide micro greens, beets, and carrots. Then dress the salads to your liking and enjoy! Copyright © 2019 Just Eat Food. All Rights Reserved.